The Configurable List Widget requires a little more to set up, but its not hard at all. Where Option 2 Will be selected by default when the form is opened. Time format - allowed values are 12 (with AM/PM selector) and 24. If undefined or invalid, it Defaults to 12. Important Message: static : Click on the '+' button to add a new row. After completing each field configuration, hit the return (enter) key to add a new field configuration on a different line so that the widget can treat it as a new field setting. To Limit the number of rows that will be added on your form, enter the number in the Maximum Rows Number input Box. 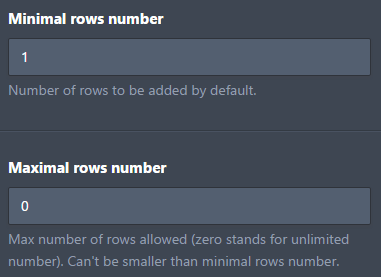 To automatically load the first row (or more), enter the number in the Minimum Rows Input Box. Its often necessary to style your form to look exactly how you would like - perhaps to match your product image, or corporate identity among other reasons. 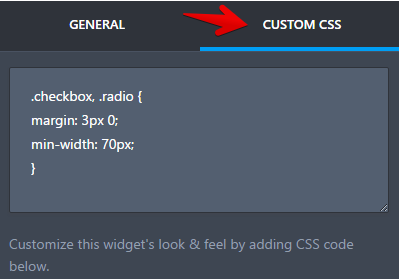 With this widget, you can further customize how the list looks by adding custom CSS. You are welcome to clone/copy the form; take a closer look or modify the form as your own. The Custom CSS part can look a little too technical - but not to worry - we would love to help - just let us know. That's all it takes to configure the widget. We would love to hear what you think, or share your experience so that we can continually improve the tools that make your form awesome! I have implemented the widget to give users the ability to add a series of dates. However, we are now using the form in different countries and were wondering whether the months within the calendar could be translated into other languages? We've added translations via the Settings tab, but they are not being picked up by the widget & I can't see a way to stipulate other languages in the widget settings. Is it possible to make one checkbox option a text field that a client can type in an option not listed? How can I remove the add button? Could we add conditions on each of the fields in the configurable list? eg. If user selects the radio button 1, then the drop down would show a set of options, if option 2 is selected, a different drop down is shown. the "Add Row" button Label keeps showing "Add Row" no matter what it's typed in the Label for Add. customized with : "+ Add". i get "+ Add Add Row". How do I add multiple text fields / multiple calendar fields? How do I add a "Browse Files" button to this so my client can upload a photo? How to do I change the color of the text? Como ocultar texto del desplegable? Custom CSS does not appear on this widget. I am wondering how to adjust the date times within the configuration list widget - ie; max past date and max future date. At the moment the form only allows the year 2009 as the earliest year to be born. How do I configure the time field to show no default time? I cannot do it. I’ve tried all week. Is there anyway I can pay someone to help me out. You keep sending me emails but I just don’t understand anything. Hi, may I know is there a way to retreat the number of rows so that I can perform some dynamic calculation on the fly? Hello there ... 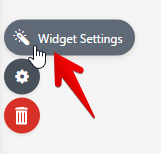 I am using the Configurable List Widget and would like to turn off all the tool tips/hover over help that pop up. Is this is possible, I am having a hard time finding this option. Here is a link to a screen grab of what I am tryin to get rid of. Is there a way to error check a text field? In this case I want a 5 digit Zip code and I would like it so there is only 5 digits allowed and ideally only numbers. The second and subsequent static will not be reflected. The first static will be listed in the outgoing email. Is it possible to make the dropdown calendar start on Sunday instead of Monday? When i linked the results of my form from the Configurable List, there is just one column with all the results. Is it possible to be export in different column for each question ? When using the drop down list option in the configurable list is it possible to have the options that you've search for move to appear at the top or closest to the search box? i was trying to link docusign and twilio to the form, but it always showed me something is wrong. can you teach me how to do it? Thank you! 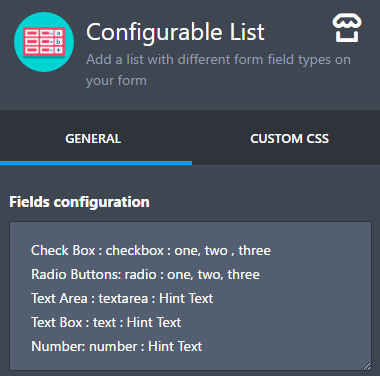 Please let me know if using the configurable list widget, if there is an option to include a calculated field. Following the recent update to the PDF designer, the content that had been entered such as text in a text box, now only shows the column header, not the free text that has been input. How do I build a checklist of 10 different numbered descriptions (static text) with each item that requires 3 columns of checkboxes (for eg. Yes / No / Maybe) and 1 column for remarks (text)? Seems from some of the comments below, line breaks are very much in demand for this widget. Pls find a way to include it. i LOVE THIS widget, finally something that covers everything! However, even with your example form, the boxes overflow. Is there a way to make the selection smaller (smaller text, wrap text?) to fit the full box onto the page? For the 'Number' field box, is there a way to exclude negative numbers? I want to validate the email field in this widget. How it can be done? Anyone, please suggest? I've already reviewed the instructions on how to setup a configurable list and those instructions do not address how to limit/restrict/format the number entry field. I need to restrict commas in dollar amounts and include a dollar symbol. Right now I have some users entering commas, and others who are not. This is problematic when exporting the data for analysis and I need to make the entries consistently formatted. Can you help? Is it possible on the number field to have it automatically enter a $ sign and comma for dollar amounts such as $500,000? would it be possible to integrate the "autocomplete" function in one of the fields? I know there's a dedicated widget for this function, but we need a dynamic matrix. The configurable widget is perfect, it only lacks this smart search kind of function for long lists (of names in our case). I need to remove the "Add" button. whatever number I use the text area is always the same form (asx without personal CSS). Can you set the width of a column using CSS? Can you have the Radio Buttons in multiple columns? Everything shows up on the website, looks great. When it's filled out it works and shows up on Jot Form but doesn't get sent in the Email. What am I doing wrong?? This is nowhere near flexible enough for what I need. You MUST update this widget to remain competitive. For my project, multiples of the same thing are a core function, and I have 20 fields which may need to be duplicated in one large block. Dealing with the configurable list Widget is clumsy and inefficient... and it look awful and amateurish. Despite, the many great widgets that you offer, this one is so bad, and so important to my project that unfortunately I will have to use Cognito for their much better 'repeating section', despite their lack of flexibility around styling and so on. I love this - is there any way though I can make the entries more grouped instead of a big long row? HI team - I can't sort out how to narrow down the width of the configurable list? On desktop it appears fine, but it does not resize to mobile well, and the item is broken in the survey. Any advice on how to insert a "line break" in the configurable list? How do I pass values via the URL to pre-fill form fields in the configurable list? This configurable list is Awesome. But, is there any way to move the "add" button to the same line (row) as the textbox fields? 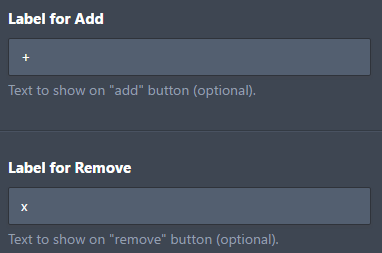 And subsequently for any "added" row for both the "add" and "remove" buttons to be side by side on the same rows also? fantastic tool! how can i configure the width of any field? is it possible? Is there a way for me to ensure that only unique entries will be accepted in the number field? I just want to use the Month and year of Date? My Configurable List widget is off alignment on mobile version. How can I fix it? How can I force alignment of fields created in the Configurable List Widget? How to set up other email for submission alerts?